The Gold Seal UAVGroundSchool is the premier Part 107 test prep product on the market. It was the first one in existence and is the only Remote Pilot study program that has been approved by the FAA. It was evaluated by the FAA-FSDO (Flight Standards District Office) and approved as a Part 141 Remote Pilot Ground School program in October, 2017. No other Remote Pilot program has ever received FAA approval. UAV Ground School has nearly 30 video and interactive lessons divided into four sections. Access the program at any time, 24/7, on any computer with internet access. It tracks your progress and archives every quiz so that you can pick up where you left off! Quizzes and practice tests are randomized every time you take them. No “canned” tests here. Every one is unique. 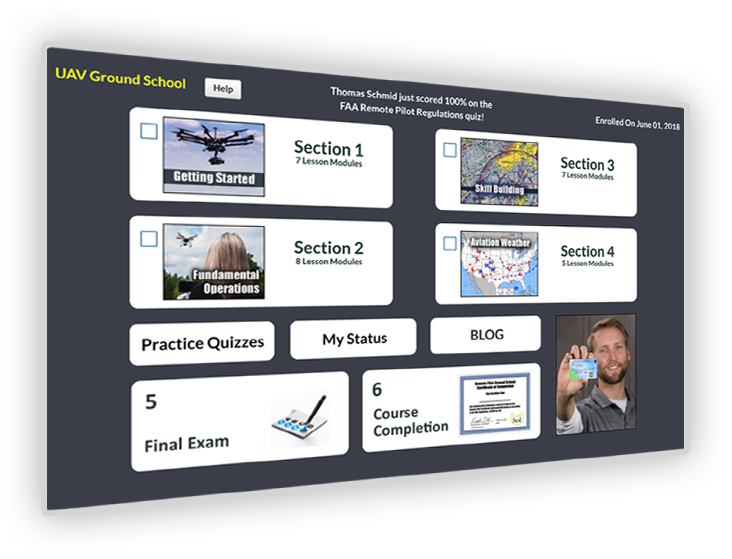 Plus, the UAVGroundSchool includes built in Flash Cards so that you can quickly practice for your exam. Review old quizzes at any time to identify your weak areas. You can even print out PDFs containing just the questions you missed! It is a great way to make your final FAA exam preparation fast and easy. Gold Seal includes the largest database of FAA questions. No other product provides such thorough and accurate study materials. You'll have lifetime access to the UAV Ground School program, plus our “You Pass or We Pay” guarantee. If you complete the program and meet the completion standards, you WILL pass your FAA Remote Pilot Initial Exam. If you don’t, we’ll reimburse you for the cost of the test! It’s a wonderful insurance policy.